In case you forgot, the city is hosting a fundraising walk for a major charity and you have been tasked with using FME to put together the data that will form the event map. In this part of the project we’ll add another of the source datasets to the workspace as a Reader. This format will need close inspection of the Reader parameters to make sure we&apos;re reading the data correctly. The existing workspace already has a Reader for MapInfo (parks) data. 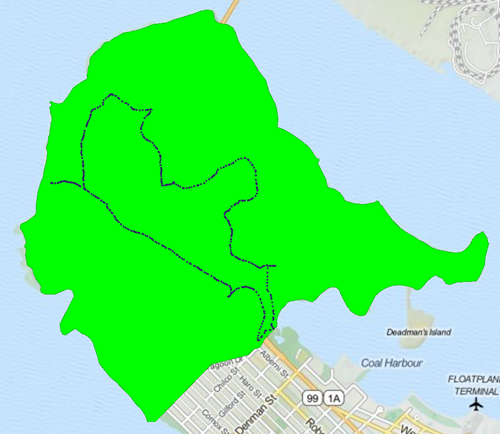 Now let&apos;s add one for the most important dataset - the walk trail. This was walked by a colleague and captured on his GPS device. The dialog includes various parameters for this Reader and a preview of what the source dataset looks like. 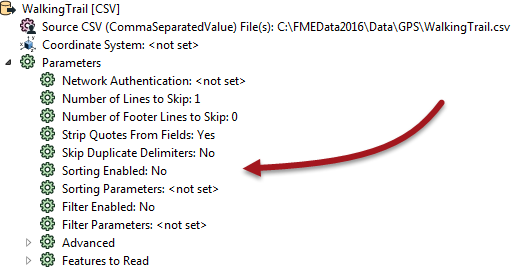 By default the Separator Character should be a comma (change it to a comma if it is not) and the File Has Field Names parameter should be turned on. 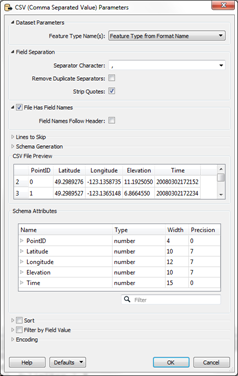 By setting these parameters FME will convert the plain-text CSV data into true spatial features. Click OK to close this dialog and OK again to close the Add Reader dialog. Some things just won&apos;t wait. It&apos;s important to set these parameters now as they affect how the schema is depicted on the canvas. If I mess this up I&apos;d have to delete the Reader and re-add it. That&apos;s not an efficient use of time and resources. Notice that some of the parameters we set earlier are no longer available. That&apos;s because they specified how to define the feature type schema, and it&apos;s too late to set them now. Other parameters we could set, but don&apos;t really need to (the data should already be sorted in the correct order, for example, so we don&apos;t need to apply the sort parameter). Feel free to add Inspector transformers and run the workspace to inspect what we have created so far.